Conserted Consort: "And all the while sweete Musicke did apply Her curious skill, the warbling notes to play." Although set in the faerie world of celestial Muses, medieval pageantry, and piping rustics, the historical context of Spenser’s “The Faerie Queene” plays a slightly different tune. Among the many industrious and illustrious composers of the 16th century I find the English composer William Byrd to have particular import to the audience and fairy world of Spenser’s epic. Detail of Queen Elizabeth I's "Armada" Portrait (unknown artist, 1588). The political/religious climes of England during the late 1500s were tense to say the least. Protestant England was beset on all sides by Catholic neighbors (Ireland, sometimes France, Spain, Scotland) in a highly hostile and competitive world (think the looting of the New World and Burt Lancaster as the Crimson Pirate). In Book V Spenser wrestles allegorically with the trial and execution of the Catholic Mary, Queen of Scots by Protestant Queen Elizabeth in 1587, an event that shook the current understanding of the divine justice of absolute monarchy. Add to this mix William Byrd (1543-1623): virginalist, sheet music baron, CoE anthem composer, musician of the Royal Chapel, and Catholic. It is an outstanding testament to the favor that he somehow achieved with Queen Elizabeth that he retained his faith in the face of so much hostility. The same mind that wrote beautiful motets for the Church of England also wrote exquisite Latin Masses for three, four or five voices to be sung in secret. I’m listening to the Mass for four voices now. The texture is so private and supplicating and earnest. I love the declamations of the Gloria. Gorgeous. And the historical context lends it such honesty– far removed from the posturing of the courtiers. I have known and enjoyed Billy Byrd primarily through various compilations of his keyboard pieces for virginal. In collections such as the Fitzwilliam Virginal Book and My Ladye Nevells Booke we observe the composer in more a posturing role. If not outright composing pieces dedicated to powerful patrons, he is at least contributing to the culture of the refined lord and lady, masters of the arts and yet disdainful of excess. (That being said it must have been a hard blow for the gallant duke or duchess who picked up the Fitzwilliam and found John Bull’s 30 Variations on Walsingham yawning like Charybdis before them!) I particularly enjoy such song variations of Byrd as Jhon come kisse me now, 16 variations on a lovely, mushy love song with modal, hexachord spices. The Bells extracts 9 variations out of a two note bass figure with something of a minimalistic, meditative rhythm. Ut, re mi, fa, sol, la and Ut, mi, re show Byrd at a very pedantic and ambitious mode, exploring distant tonalities with all manner of strange accidentals. 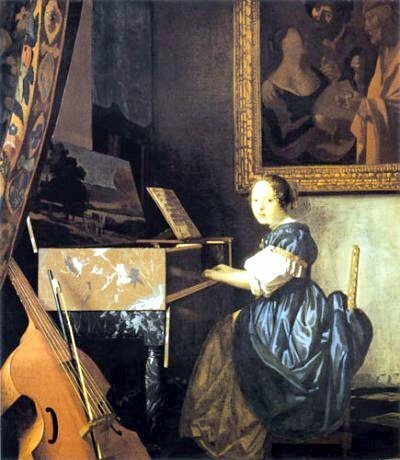 Vermeer's Young Woman Seated at a Virginal (1670-72). And after that scales and arpeggios on the viol. Then lunch. So check out Byrdman when you can. The Petrucci Music Project has a lot of his virginal pieces as well as his Mass for five voices in sheet music form. (Love that Petrucci and his projects!) The virginal as an instrument is surely a strange and acquired taste. (I believe Stravinsky compared it to the sound of two skeletons copulating on a tin roof.) I love it and would encourage you to listen to a good recording from a skilled musician with life in their fingers and hearts. Kathryn Cok plays an extremely amazing Walsingham on her Lyrichord Early Music album entitled “Dr. Bull’s Jewel”. Lastly an excerpt from a contemporary of Spencer and Byrd, the dashing and tragic Sir Phillip Sidney: “Astrophil and Stella”, Sixth Song. Chief praise on that he lays.